← Measuring Culture: How does recognition fit in? There's been revelation after revelation from the Australian Royal Commission into Banking that has shone a light on just how immorally the banks and their employees have behaved in the pursuit of incentives and rewards. For those not familiar with the details this includes knowingly charging the deceased for financial advice, overselling commission heavy financial products, moving assets into trusts from which they cannot be tax effectively removed, and doctoring reports to the regulator to hide from repercussions of malpractice. The public is shocked .... Politicians and bureaucrats are distancing themselves from the industry they've stoically defended by now scrambling to think up tighter regulation and tougher (even jail time) penalties .... the freshly minted CEO's at CBA and AMP, and the incumbents at Westpac, ANZ and NAB are promising things have changed .... meanwhile industry analysts are speculating the banks will sell off their advisory arms and get back to basics of managing deposits and loans. Nothing is concluded yet, but it's clear there are many dysfunctions that have contributed to this state of affairs. We think there is a paradigm that can reset the behaviour of the Banks on these dimensions very quickly by introducing personal and radical transparency. 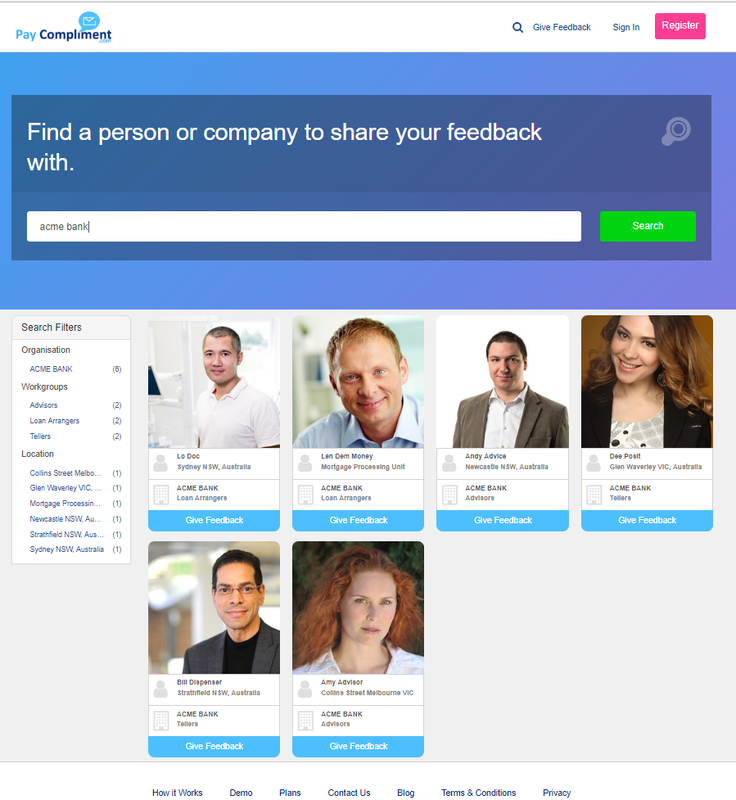 A personal feedback page for every bank worker that enables consumer and co-worker feedback to flow to that employee at any time, on any topic. This does not just mean complaints, but also gratitude, appreciation, even clarification and follow up from prior interactions directly with the individual. This works at several levels, but most importantly it balances the extrinsic motivation of a commission with the intrinsic motivation of social connection and accountability to (hopefully satisfied) customers. There's a large body of evidence that shows people will do the right thing when they know they are (or could be) "being watched". 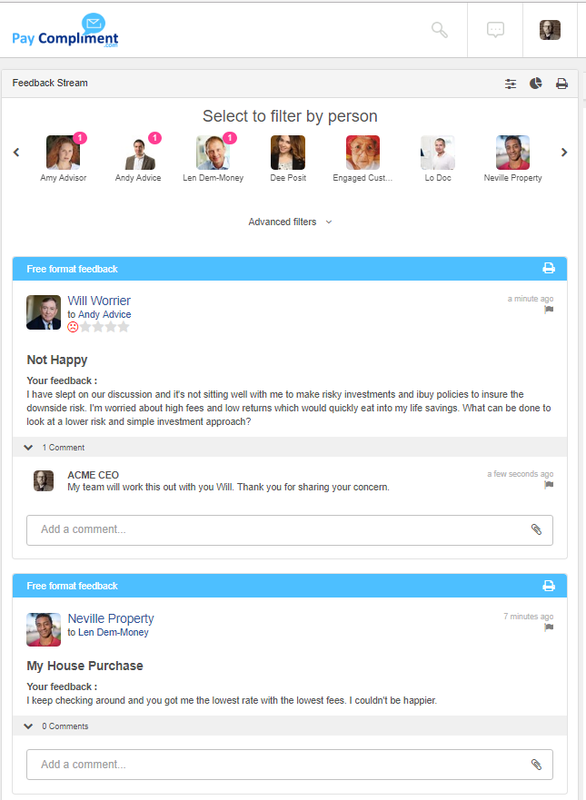 A tamper proof real time feed of employee reviews direct to their manager. Besides reinforcing the accountability model for the individual, explicit insight into the performance of each of their employees allows in- the-moment coaching, rapid intervention to issues without the pre-requisite of formal escalation. For the customer it can mean responsiveness to customer issues without the friction and inconsistency of call centres or the time and inconvenience of face to face appointments. Rolling up all employee feedback provides executives with a helicopter view of sentiment and context of conversations with the option to drill down from 'all of business' through to a division or location and all the way to a specific team or individual. If words such as risk, oversold, unhappy, disappointed, or angry are bubbling up, there's the instant ability to find out where and why. Similarly, if words such as delighted, happy, satisfied and such top the sentiment scorecard then it's just as easy to find the people to pat on the back for doing the right thing. What’s certain is that access to all sentiment at any time removes the opportunity to deny knowledge of issues later on. 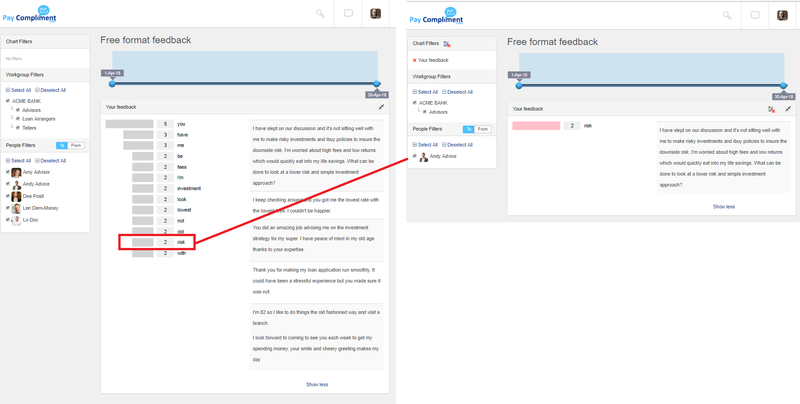 Feedback ID's remove obstacles for anyone who wants to review and report on performance, so that the number of performance signals is maximised. 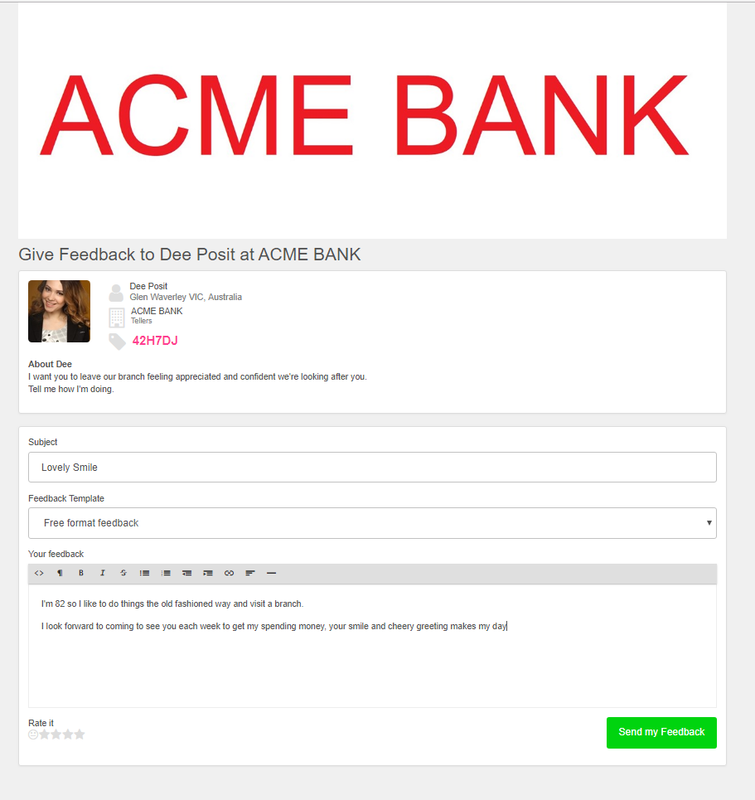 Additionally, a Feedback ID can be passed on via a business card, in an email signature, on a name badge, with a piece of financial advice, or on a transaction receipt to name just a few of more than 55 touch points we have identified that a bank could feedback enable. Unlike a public review site like Google Places, Facebook or Yelp, review profiles are public but reviews are completely private, being shared only with the employee and their management chain. This makes these reviews suitable for disclosure of facts pertaining to finances, advice and follow up all inside a secure chain of command. When the Royal Commission concludes, we doubt that consumers will trust the regulator to hold the banks to account on their behalf. We believe the banks themselves can provide an alternative to regulation where each individual consumer has the platform to hold their banker and financial adviser to account directly, under the nose of their management and executive team. It might be seen as a brave move for a bank to create such a level of access and transparency, or it might be seen as a brave move for them not to.